Managing a network for your company is a complex proposition. The technology is constantly becoming more complex and users are becoming more reliant on mobile technology. However, building a network that automatically personalizes wireless service vastly simplifies the task of optimizing a mobile workforce. 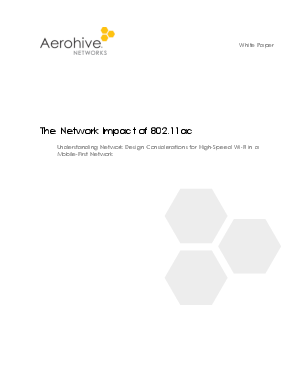 Download this whitepaper to see how a mobile-first network will allow your organization to save money, create a simpler network, and future-proof the WLAN by allowing new high-speed network technology to be easily integrated.